EchoSpan easily integrates with your existing HRIS or employee performance management system. Using a variety of connection methods, you can integrate your EchoSpan account with common HRIS platforms and employee management systems such as Workday, ADP and SuccessFactors to name a few. Setting up automatic data exchanges between your HRIS and EchoSpan allows you to ensure that databases in both applications are regularly synchronized. You can also avoid time-consuming and error-prone double entry of data. For example, if you have configured a data connection to EchoSpan to synchronize your employee roster with the one stored in your HRIS, the EchoSpan database will be automatically updated when employees change positions or managers or are terminated. Single sign-on (SSO): SSO allows your users to log into EchoSpan with the same user name and password they use to log into your corporate intranet, without exposing these credentials outside of your organization. EchoSpan supports SSO via the SAML 2.0 standard. Part of this standard requires that user databases be maintained on both sides of the assertion. Using our data integration tools, you can automatically maintain synchronization between your user database and EchoSpan's; ensuring only valid users can access our application. Downloading review data and scores: Via EchoSpan's API, you can configure automatic download of hundreds of pre-built data exports or custom data exports built for your organization. Downloads are provided via HTTPs and can be created in a variety of formats. Uploading legacy review data: If you have transitioned to EchoSpan from another 360-degree feedback tool, you can use our legacy import features to migrate your existing review data into our tool. Once migrated, you can run reports within EchoSpan on your legacy data as if it were originally created within our tool. Uploading legacy review reports: If you are using EchoSpan to host reports from a previous 360-degree feedback or employee performance management tool, you can use data integration tools to upload and maintain libraries of documents including PDF, Word, Excel and other document formats. Flat file via FTP: Using secure FTP, you can upload or download flat files to and from EchoSpan's servers. This method of integration is technically simple, reliable and usually doesn't require programming knowledge to configure. EchoSpan API: EchoSpan includes an API that allows upload and download of data. Common requests include upload of review participant data and download of review scores and responses. Access to API features can be configured by the customer and requires some programming knowledge to set up. Client API: EchoSpan's development staff can create custom connections to your API for data upload and download. We have scripts created for most common HRIS APIs already, but in the event one doesn't exist, we can build it for you. 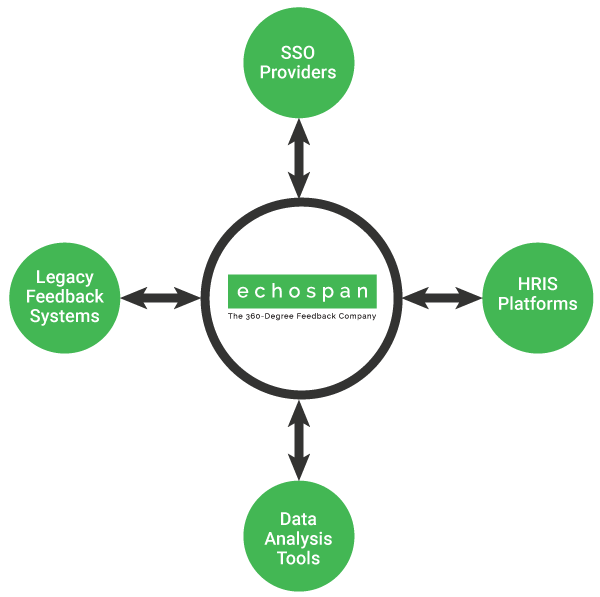 Most data integration options are available in the Enterprise Edition of the EchoSpan tool. To get started, please contact your client manager and they will set up a call to discuss requirements and/or provide you with data access instructions for your account.